Jesse James as he appeared circa May 22, 1882. Image online via the Library of Congress. Jesse Woodson James was the son of a preacher (Robert Sallee James) and a tall, strong-willed woman (Zerelda Elizabeth Cole). The couple met at a revival meeting in Stamping Ground, Kentucky (named for herds of bison which once grazed there) and married three days after Christmas, 1841. After Robert graduated from Georgetown College, the young couple decided to move from Kentucky to northwestern Missouri. 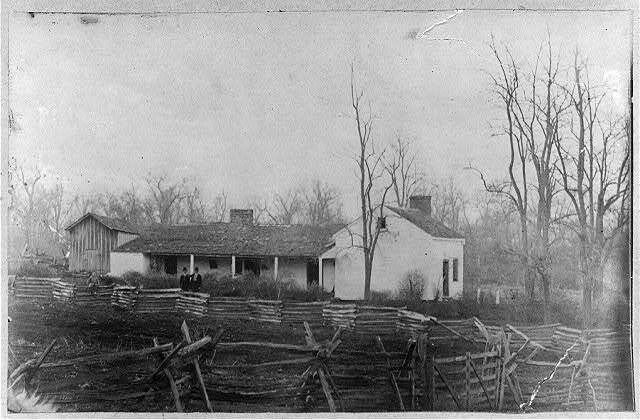 Robert and Zee (as his wife was known) settled in Centerville (later known as Kearney). Their Clay-County neighbors helped them build a log-cabin home and the couple became farmers. Robert also pastored a small church - New Hope Baptist - outside town. Their first child was a boy - Alexander Franklin James. Frank, as he was known, was born at the family farm on January 10, 1843. Eighteen months later, a second son - named after Reverend James - was born, then died thirty-three days later. Jesse entered the world on the 5th of September, 1847. He was two years old when his sister, Susan Lavenia James, was born on November 25, 1849. History records that Rev. James (who had a Master’s Degree) was a better preacher than a farmer. His efforts helped the congregation to expand while slaves helped the family’s hemp crops to grow. Part of the Southern economy, plant fibers from the James farm ultimately became twine and hemp bags used in the slave-intensive cotton industry. In early 1850, when Jesse was still a toddler, the lure of gold in California profoundly impacted the young boy's family. Rev. James agreed to serve as a wagon-train chaplain for local men seeking to find gold in California. It is said that later, when the toddler was a grown man, he tried to find his father’s unmarked grave. He could not. Would Jesse have turned out differently had his father lived? Would Rev. James, a Southerner, have supported the South when war came to Missouri? Could he have envisioned that his adopted state would eventually see more Civil War fighting than any other, save Virginia and Tennessee? Why did so much bloodshed occur in Missouri? Bos, Carole "A SON of the SOUTH" AwesomeStories.com. Oct 01, 2007. Apr 18, 2019.